Who Speaks for Islam? : Muslim authorities call for an end to militant violence. ￼FINAL REST. 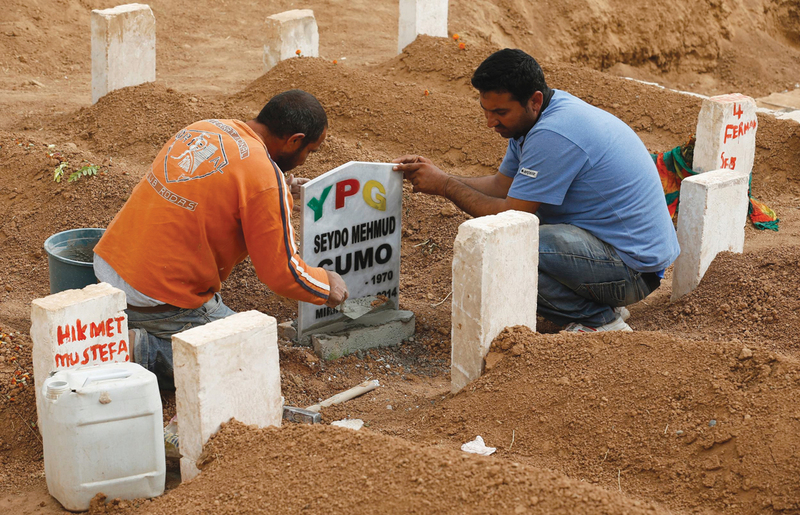 Men place a headstone at the grave of Seydo Mehmud Cumo, 44, at a cemetery in Suruc, Turkey, Oct. 11. Cumo was a Syrian Kurdish fighter killed in clashes with Islamic State militants in Kobani, Syria. Faced with the savage persecution of Christians and other religious minorities in Syria and Iraq, that is a question one often hears as the atrocities of the so-called Islamic State continue in the name of Islam. Why aren’t moderate Muslim leaders speaking out against the Islamic State (also known as ISIS or ISIL)? Until recently the response to this question has been that Muslims are indeed speaking out, and loudly. But there have been two major obstacles to their voices being heard. First, Islam is not a centralized religion like Catholicism; there is no single person or institution that speaks for all Sunnis or all Shiites, much less for all branches of Islam. When the pope speaks out, he speaks for more than a billion Catholics. There is in Islam no person or structure parallel to the pope or the secretary general of a religious body. Second, many of the voices raised against crimes targeting religious minorities have appeared in newspapers and languages rarely picked up by news agencies that publish in Western languages. It has not been the case that no one was speaking out but that no one in the West—for various reasons—was listening. The situation has changed considerably in recent months, and the non-Muslim world needs to take notice. Muslim scholars as well as official and unofficial organizations have been issuing significant condemnations of the movement called the Islamic State and its self-declared caliphate. Grand Ayatollah Ali al Husayni al-Sistani, the leading Iraqi Muslim authority, issued a brief fatwa in June condemning the persecution of Christians and Yazidis and inviting them to seek refuge in southern Iraq. On the Sunni side, Muhammad Haniff Hassan and Mustaza Bahari, two Muslim scholars, published a list of 86 organizations and individuals that have spoken out against the Islamic State. The list contains statements made by the Grand Muftis of Syria, Iraq and Saudi Arabia and the political leaders of Indonesia, Malaysia, Morocco, Saudi Arabia and Iran, together with numerous Islamic universities, societies and individual scholars. The Vatican News Service (07/26/14) and Eurasia Review (10/1/14) ran articles on the many different Muslim groups that are responding to the challenge of the Islamic State, declaring it illegal by the standards of both Islamic and international law. The most detailed and perhaps most devastating critique and condemnation of the Islamic State, however, was released in English in September in an open letter to “Dr. Ibrahim Awwad Al-Badri, alias ‘Abu Bakr Al-Baghdadi,’ and to the fighters and followers of the self-declared ‘Islamic State.’” Al Badri is the leader of the Islamic State who declared himself caliph on June 29, 2014. He has changed his name several times, each time giving himself a grander pedigree, ultimately linking himself to the tribe of the Prophet by taking on the name Al-Qurayshi. The letter pointedly acknowledges none of his recently assumed names, to say nothing of his title as caliph. The letter was originally written in classical Arabic and is clearly intended first and foremost for Al-Badri and the fighters of the Islamic State. Even a cursory reading indicates that the document was not produced primarily for media distribution. For the average reader, especially in the West, the document is ponderous, detailed in the extreme, foreign in tone and ever so slightly reminiscent of the language of papal encyclicals. It is most assuredly not a document that translates well into sound bites. This is precisely what makes the document so extremely important. Muslim scholars and non-Muslim scholars of Islam will be studying this document for some time. It is often said, with some justification, that Islam does not presently have a discipline similar to what Christians call theology. Instead, Islam has developed a highly sophisticated system of jurisprudence called fiqh. For Muslims, jurisprudence is not merely law; it is the systematized guidelines for living a life in conformity with the will of God. Never purely theoretical, Islamic jurisprudence is geared toward solving practical problems and balancing a 1,400 year tradition with modern exigencies. Both Sunni and Shiite Muslims have developed over the centuries an extremely complex set of principles (the “pillars of jurisprudence”—usūl al-fiqh) to help scholars address contemporary problems. There is a hierarchy in the application of the principles of jurisprudence that is clearly evidenced in the letter. The first principle of Islamic jurisprudence is, not surprisingly, the Quran. A sophisticated exegesis searches the Quran for guidance, taking into account the language, the circumstances in which the verses were revealed and their context within the entire Quran. In second place is the Sunna. The Sunna is a vast collection of sayings by the Prophet or stories about the Prophet related by his closest companions. There are several “canonical” collections of the Sunna and an exacting science of determining the value and relevance of any given tradition. There are traditions that are “strong” and those that are “weak.” This difference appears in the letter. Therefore, traditions have to be carefully sifted out and evaluated before they are included in an argument. Third, there are the examples from Islamic history—a type of precedent. Last, there are interpretive principles that help the scholar deal with situations for which there are no clear precedents. These are in decreasing order of authority. The Quran is the highest authority, followed by the Sunna. History and analogous reasoning in unprecedented situations are of a lesser authority. The letter deals with 24 topics. The opening topics lay the ground for or against the Islamic legitimacy of the Islamic State. As would be expected, jihad receives considerable attention, with subtopics like rules of conduct of jihad, intention, goal, killing of innocents, killing of emissaries, etc. Each topic is treated in detail, starting with the Quran and working down through the contemporary situation. The letter declares the killing of innocents to be mūbiqat, a mortal sin (No. 6). The killing of emissaries, a category that includes reporters and aid workers, is haram, or totally forbidden (No. 7). In dealing with Christians the letter states: “These [Arab] Christians are not combatants against Islam or transgressors against it, indeed they are friends, neighbors and co-citizens. From the legal perspective of Shariah law,they fall under ancient agreements that are around 1,400 years old, and the rulings of jihad do not apply to them” (No. 10). The paragraph after that declares that the Yazidis, whom the Islamic State fighters consider “devil worshippers,” are, in fact, “people of the Scriptures,” together with Jews and Christians, and hence protected. The language of the letter, especially in English translation, contains expressions and references that readers not familiar with Islam could easily overlook. In the paragraph dealing with slavery, the letter recognizes that the Islamic State has taken and sold human beings as slaves. The letter states, “You have revived strife and sedition, and corruption and lewdness on the earth” (No. 12). The word sedition in the English text has the Arabic word fitnah after it in parentheses. The notion of fitnah in Islam evokes very powerful feelings. Fitnah is rebellion, the breakdown of all social and moral norms and total chaos. After the death of the Prophet, some Arabian tribes abandoned Islam and fought against the Muslims. That was called the First Fitnah. Islamic law provides for the relaxation of many rules in order to avoid fitnah. In Islamic jurisprudence, fitnah would never be the lesser of two evils. The second expression is “to spread corruption (fasād) on the earth.” Several times in the Quran the expression “to spread corruption on the earth” appears, and it is looked upon as the greatest of crimes and the crime subject to the harshest penalties (5:32, 34; 7:57, etc.) Anyone familiar with Islamic legal language would recognize that this is the harshest accusation one Muslim can make against another. At its publication in September 2014, the document was signed by 126 Muslim leaders and scholars. Several Muslims have added their names since the publication. As a religious ruling and as an intra-Muslim document, it would be unfair to look in the document for any support of things like U.S. policy in the Middle East or the civil war in Syria. Muslim religious documents are no more obliged to approve of U.S. foreign policy than are documents issued by the Vatican. In point of fact, in the last 15 years the Vatican has on several occasions disagreed with U.S. policies in the Middle East. It would be unrealistic and unfair to expect more of Muslims. While the document is extraordinary by any standard, it would be unwise to either overestimate or underestimate its authority. As mentioned earlier, there is no one person or institution that speaks authoritatively for all Muslims. It is to be expected that there will be Muslims who disagree with the document or reject it entirely. Nevertheless, there is in Islam a principle called ijma‘, “consensus,” similar to the Catholic principle of sensus fidelium. According to this principle, if Muslims agree on something, they are immune to error. Of course, the vast majority of the instances of ijma‘ are judged after the fact—the community came to an agreement on something in the past and it has become common practice. There are, however, no criteria as to exactly how or when an ijma‘ is achieved. Nor is there any given number of Muslims or percentage thereof who must agree on something for it to constitute a consensus. Nonetheless, the unusually varied and large number of Muslim leaders and scholars who have come out against the Islamic validity of the Islamic State and who have condemned its atrocities must carry great weight in the Muslim world. While there may be some who do not agree with everything in the document or some who do not think it goes far enough, it remains a masterpiece of Islamic juridical thought and procedure and a document eminently worthy of the respect and attention of all religious people who are committed to interreligious understanding. To understand Islam it is necessary to first study its beginning, its history and its current state of being, It is a monolithic governing system dictated by the ideology found in the Koran which is actually interpreted by individual mullahs.Its divisions into various warring sects started with the death of Mohammad and continues today. First become acquainted with the writings of historians about "peaceful" Islam. Harvard's Professor Emeritus Samuel P. Huntington's 1996 "Clash of Civilizations" -- concludes "Islam's borders are bloody and so are its innards" (Note: Huntington included the following footnote comments on the same conclusion of his article published in a Foreign Affairs: No statement in my Foreign Affairs article attracted more critical comment than "Islam has bloody borders." I made that judgment on the basis of a causal survey of intercivilization conflicts. Quantitative evidence from every disinterested source conclusively demonstrates its validity" - Huntington.) -------------------------------------------------------------------------------- From: Princeton's Islam expert Professor Emeritus Bernard Lewis 2003 "The Crisis of Islam - Holy War and Unholy Terror" Even Princeton's Islam expert Professor Emeritus Bernard Lewis' in his 2003 "The Crisis of Islam - Holy War and Unholy Terror" acknowledges the seriousness of the Islamic problems (not only al Qaida) existent in the Islamic world and how these problems manifest themselves worldwide. One of the book’s concluding sentences ..... “ Sooner or later, Al Qaida and related groups will clash with the other neighbors of Islam -- Russia, China, India -- who may prove to be less squeamish than the Americans in using their power against Muslims and their sanctities.” Second for today's Islamic terrorists study the recent article: "What ISIS really Wants at": http://www.theatlantic.com/features/archive/2015/02/what-isis-really-wants/384980/ "The reality is that the Islamic State is Islamic. Very Islamic. Yes, it has attracted psychopaths and adventure seekers, drawn largely from the disaffected populations of the Middle East and Europe. But the religion preached by its most ardent followers derives from coherent and even learned interpretations of Islam. " Then ask the question: "Who speaks for Islam? Not one Muslim or Muslim organization speaks for Islam. Any Islamic mullah can issue a Fatwa, an Islamic license to kill, on anyone for any perceived slight of Islam, the Prophet or whatever reason he thinks justifies a death sentence. Any Islamic mullah can incite riots, violence and killing over any perceived offense to the religion In the real world, issuing an order to or soliciting for someone to kill another person or inciting violence are criminal offenses and subject to arrest and trial but political correctness allows Muslim clerics to order killings without fear of punishment and the Western world cringes at the idea that a fatwa or a threat might be issued for an author, comedy show, publisher, movie director, actor, historian, museum or even a University. The Metropolitan Museum in New York and Yale are examples along with Comedy Central that have practiced self-censorship and political correctness under or to avoid threat or actual attacks from Muslims. Until the first arrest order is issued for a mullah who declares a fatwa against anyone for any reason or incites violence, the rest of the world is under the control of radical Islam. Where in America are the peaceful "Muslims against ISIS protests", "Muslims against genocide of non-Muslims protests", "Muslims against Boko Haram protests", "Muslims against sharia" protest groups, the "Muslims against fatwas" protest groups, the 'Muslims against suicide bombers protest groups", the "Muslims against car bombs in Times Square, in public markets, pressure cooker bombs in Boston, in assemblies of job seekers and other crowded places" protest groups around the world? Where are the "Muslims protests against the Islamist murderers killing of American diplomats and innocent workers"? The sound of silence is deafening and silence signifies assent." E. Patrick Mosman, Your reply is contradicted by the post and the actual contents of the document in consideration. The document is, for Muslims, authoritative, at least in the way any formal legal argument would be. If a Muslim wishes to contradict it he needs to deal with the arguments made, because it is grounded in the authorities of Islam. Moreover, I can't help but notice how the arguments you used are in their turn often used to justify a crusade mentality against Islam in the West but in the United States especially. How is that not hypocritical? The Muslim world suffers from a lot of poverty but also political and social discontent (and often aided to an extent in this by Western policies) that not unsurprisingly makes the Muslim world a hotbed for radicalism. To that extent it is understandable that the Muslim world is dealing with a lot of extremism and radicalism; however, how is a radically belligerent view and extremely reactionary policy and attitude - especially a militant one that really does involve standing armies - in any way excusable in the West? Again, from a strictly Catholic perspective, how does one deal with the authority of the documents of the Second Vatican Council, which claim that Muslims are respected by the Church? From a more secular perspective, the dangers of a clash of civilizations are frighteningly real, and such a clash could prove totally catastrophic for all involved. Granted, human rights are not negotiable nor should Western leaders ever compromise on people's human rights. But in practice we in fact often do, and unfortunately this sometimes leaves Muslims on the suffering end of our opportunism or pragmatism, whether political or economic. That being said, every human being has a right to religion. Who decides which religions are acceptable and which not? This seems to me to be an extremely slippery slope that in practice just negates religious liberty as guaranteed by the Universal Declaration of Human Rights. To be sure, Islam definitely was around when the UDHR was propagated and became international law and was definitely understood to be a religion. To that extent Islam is arguably, to a certain extent at least, protected. What is needed here is dialogue. Understanding and agreement could go a long way to granting a sense of safety and security both to the West and the Muslim world, which may feel threatened or under attack in various areas from various causes or influences. Blanket condemnations and promotion of the view that there is a necessary and irreconcilable divergence of logic could only lead to warfare, subjugation, violence, rebellion and disorders. I believe we are all obliged to seek first the path of peace. With whom do we dialog? ISIS has shown time and again no desire to dialog, only to overcome. Other leaders in the Muslim world often disagree among themselves about various points of their "doctrine." As the author of the article points out, their is no one person speaking for Islam as there is for the Roman Catholic Church. We can dialog politically with various individual heads of state, and as you pointed out, the Second Vatican Council recognized that "Muslims are respected by the Church." As are Jews, also with us as "People of the Book (i.e., Torah, Pentateuch)." I agree that blanket condemnation of the whole of Islam gets us nowhere but tragedy. This article also appeared in print, under the headline "Who Speaks for Islam?," in the March 16, 2015 issue. Elias D. Mallon, S.A., is external affairs officer at the Catholic Near East Welfare Association in New York, N.Y.